Since 1907, this is the most traditional beach around Berlin. Hundreds of kilometers inland, sand from the Baltic Sea was used to create this magnificent beach in a lake surrounded by a forest. It is a private land and you have to pay to access to the beach. 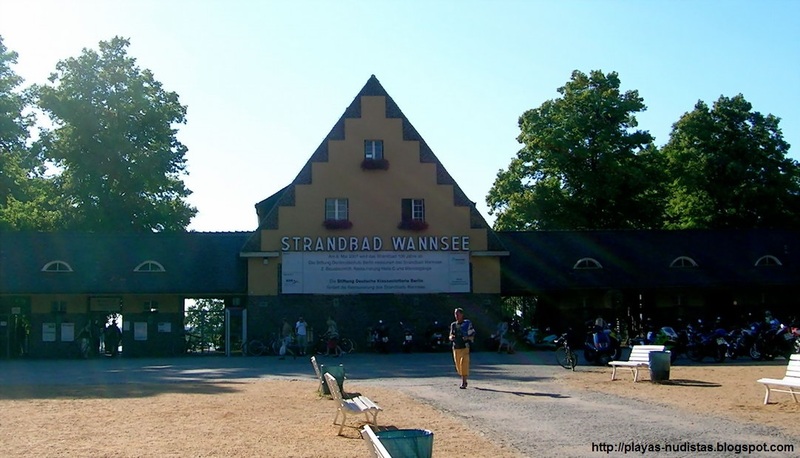 From Berlin, the most convenient way to get to Wannsee beach is to use the public transport. The S-bahn S-1 and S-7 lines stops at Nikolassee station. From there you have to cross a bridge over the motorway and then walk for 1 km to the distinctive beach entrance building. You can also go there by car, of course. 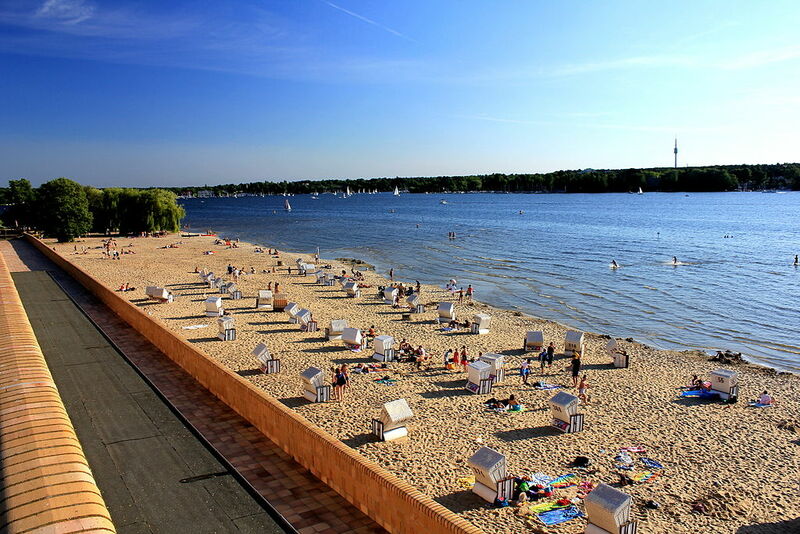 The beach lies close to the motorway that links Berlin to Wannsee, not far from this last town. There is a large parking area, you can see the coordinates in the map, but I can't recommend you a particular way. This 1 km-long stretch of golden sand is one of the few places where Berliners can go for a siwm in the hot sunny days. Even if it is claimed to be the largest inland lido in Europe, in summertime it is usually overcrowded with up to 30,000 people. The sandy area is 80 m wide and continues into the water in a gentle slope that make it totally safe for swimming. On the back, old buildings recently renewed that host most of the facilities and offer more space for sunbathing on the rooftop sundeck. Behind them there is a large green area with trees that provide the only shade in the beach. A one-day ticket costs 5.5€, but season passes are also available. and of course, the typical wicker lounge chairs. Nudism is allowed in a separated area at the northest end of the beach. There is usually less people here than in the main section.